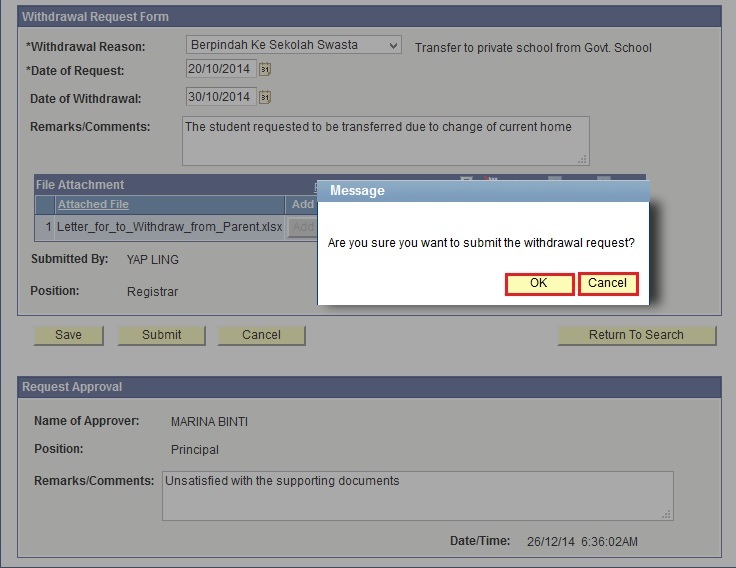 This function allows the users to resubmit, cancel, and complete a Student Withdrawal Request form. Once the Withdrawal Request is ‘Rejected’, the School Student Registrar will receive an email to inform that the submitted request has been rejected. The School Principal and Class Teacher will receive a copy of the email. Navigate to Main Menu > Records and Enrollment > Student Movement > Student Withdrawals > Withdrawal Request. To add find the existing Withdrawal Request Form, click on the Find an Existing Value tab. Enter or click on the Student ID lookup icon to search for the student that had requested to re-submit the rejected withdrawal request. User will be directed to the Withdrawal Request Form page and the status will be ‘Rejected’. 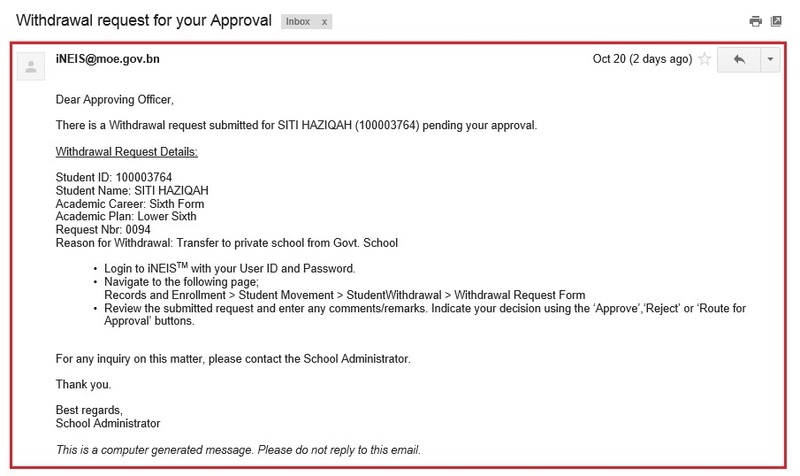 Based on the comments from the Approver, update the Withdrawal Request Form section. Once the request form is updated, click on the Submit button to re-submit the updated Withdrawal Request Form for the student. Click on the OK button to re-submit the Withdrawal Request form. 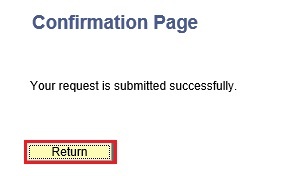 Click on Cancel button to return back to the Withdrawal Request Form without re-submitting it. 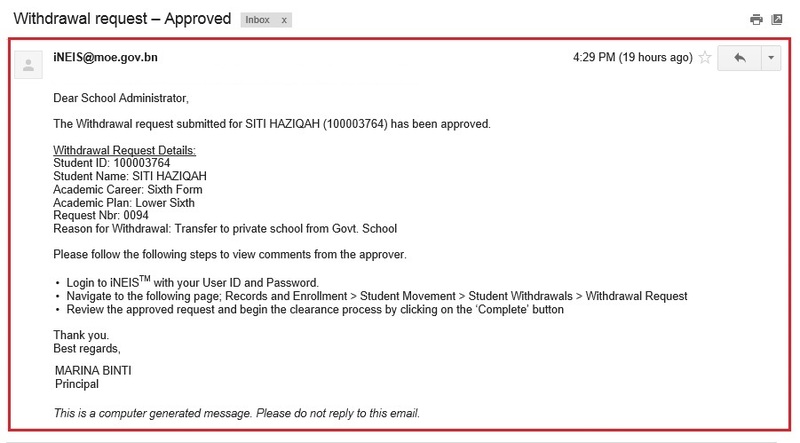 Click on the Return button on the Confirmation page once the submission is successful. The Status of the re-submitted Withdrawal Request Form will be updated to ‘Submitted’ and the Request Nbr will remain the same. Once the Withdrawal Request is ‘Submitted’, the Principal will receive an email to inform that the submitted request needs processing. The School Student Registrar and Class Teacher will receive a copy of the email. Once the Withdrawal Request is ‘Approved’ or ‘Rejected’, the School Student Registrar will receive an email to inform that the submitted request has been ‘Approved’ or ‘Rejected’. The School Principal and Class Teacher will receive a copy of the email. 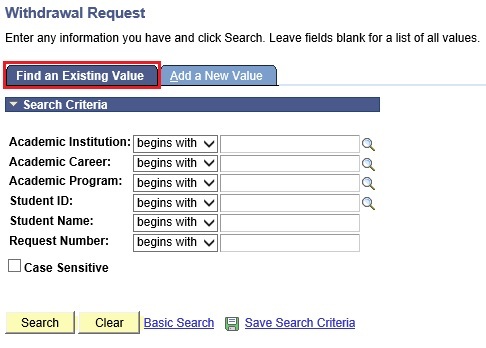 To find the existing Withdrawal Request Form, click on the Find an Existing Value tab. 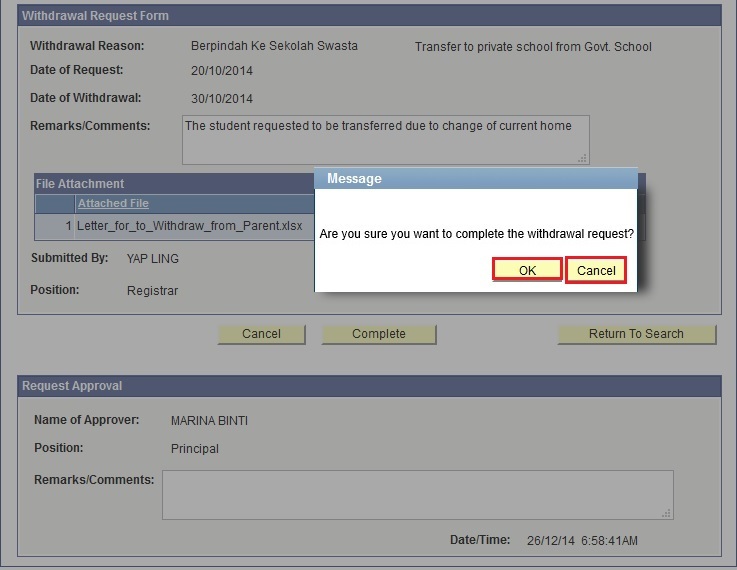 Enter or click on the Student ID lookup icon to search for the student that has to cancel a Withdrawal Request Form. User will be directed to the Withdrawal Request page. 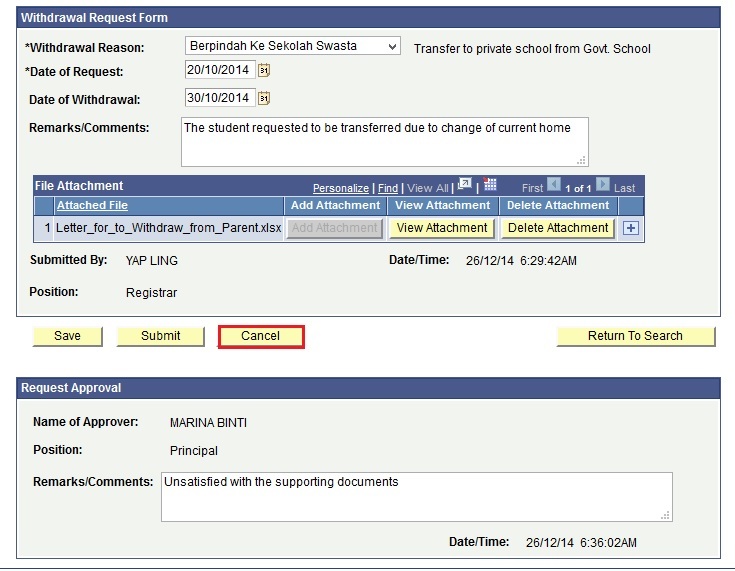 Based on the comments from the approver, if required enter any reasons for cancellation and click on the Cancel button to cancel the request. 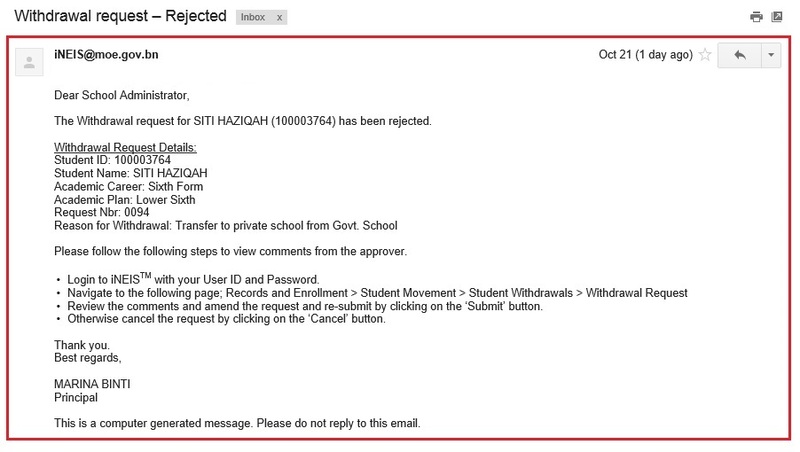 Click on the OK button to cancel the Withdrawal Request form. 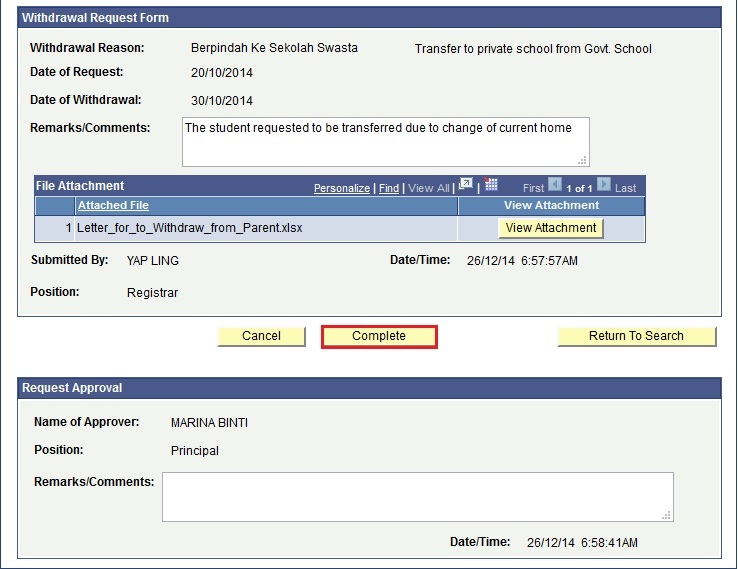 Click on Cancel button to return back to the Withdrawal Request form without cancelling it. 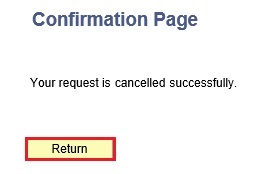 Click on the Return button on the Confirmation page once the cancellation is successful. Once the request is successfully cancelled, the Status will be updated to ‘Cancelled’. A Withdrawal Request Form can be cancelled after it is approved or rejected by the Approver/s. If there are clearance checklist items for PRES career in your school, kindly inform MOE – Department of Schools to do the setup. After the MOE – Department of Schools has done the setup, School Student Registrar or Class Teacher may continue on doing this step (Complete a Withdrawal Request). Once the Withdrawal Request is ‘Approved’ by the School Approver, the School Student Registrar will receive an email to inform that the submitted request has been ‘Approved’. The Principal and Class Teacher will receive a copy of the email. To find an existing Withdrawal Request, click on the Find an Existing Value Tab. 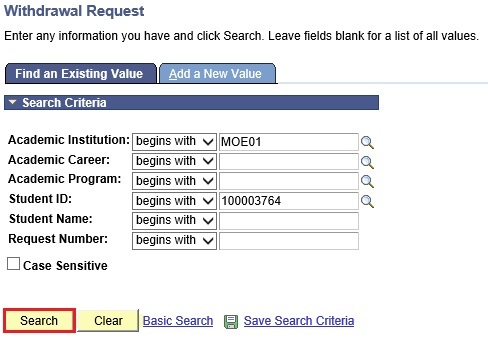 Enter or click on the Student ID lookup icon to search for the student with an approved Withdrawal Request form. Click on the Complete button to finalize the approved Withdrawal Request. Click on the OK button to complete the Withdrawal Request form. 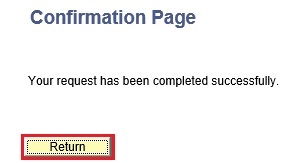 Click on Cancel button to return back to the Withdrawal Request form without completing it. Click on the Return button on the Confirmation page once the completion is successful. Once the Withdrawal Request is completed, the Status will be updated to ‘Completed’. 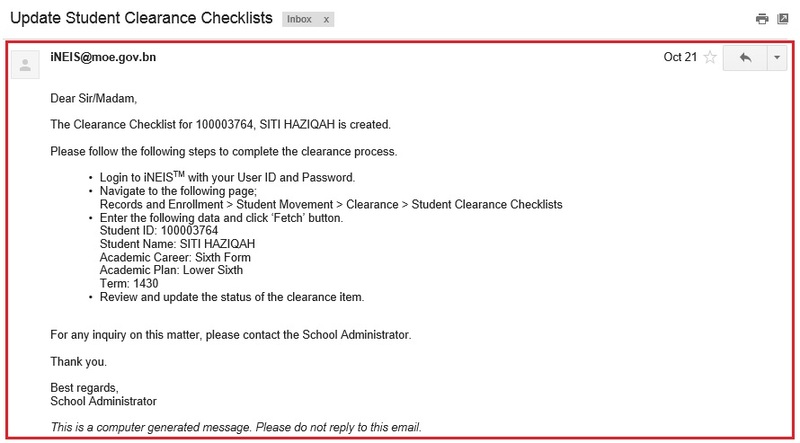 Upon clicking on the Complete button, it will automatically start the clearance process for the withdrawn student by creating the clearance checklist for him/her. All the Teachers/Persons In-charged of clearance items will be notified via email. The School Admin – Student Clearance or Teachers/Persons In-charged should update the status of the Clearance Checklist Items before proceeding in updating the Student Records. Refer to Update status of the Clearance Checklist Items.